Ugh...I know it's not the end of the world but I am seriously annoyed to be feeling sick right now! I came home from Michigan to find my bead order waiting for me but haven't been able to play with my new sparkly pretties because now I'm sick. I have a bunch of blog posts I want to write but my brain is all foggy. I swear - new non-whiny blog content coming soon! To tide you over, here's a pretty picture of one of my favorite pairs of earrings. I loved them so much that after I made a pair for my store I immediately made another pair for myself. 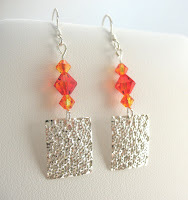 I love the Fire Opal Swarovski Crystals and the sterling silver charms are especially cool because they are feather-light.